South Korea secured a place in the Asian Cup final for the first time since 1988. Radhi Shnishel has tinkered with the three attackers behind Younis Mahmoud throughout this tournament, and brought Amjed Kalaf into the starting line-up, and switched Alaa Abdul Zahra into a central position. Shnishel was also without the suspended Yaser Kasim, so Osama Rashid started alongside Saad Abdulameer in midfield. Uli Stielike made two changes from the quarter-final win over Uzbekistan, re-introudcing Cha Du-Ri at right-back and Han Kyo-won on the right-wing. Ki Sung-Yeung and Park Joo-ho continued in midfield. Korea kept the ball almost exclusively for the first five minutes, which established the pattern of the first half quickly. They worked the ball between the back four and midfield pivot very slowly, with Iraq defending very compact in a 4-4-2 shape. The Iraqi front two dropped off to halfway and barely pressed on Korea’s defence, giving them lots of time to construct passing moves. Like in their first two group matches against Oman and Kuwait, Korea struggled when moving the ball slowly against an organised defence. When Korea could attack quickly before Iraq could get numbers behind the ball, they looked dangerous – one particularly incisive move ended with Son Heung-min drawing a great save from Jalal Hassan. They also looked good when the full-backs got high up, with Kim Jin-su flashing a dangerous cross across the face of goal early on. When Iraq won the ball, their emphasis on counter-attacking was very obvious, with right-winger Kalaf responsible for transferring the ball forward quickly. His pace was a useful outlet, and he drew two yellow cards from opponents during the match. Ki Sung-yeung, for example was booked early on after bringing Kalaf down as he burst forward. However, as Iraq were only winning the ball inside their own half, it was very difficult for them to construct genuinely dangerous attacking moves. Often, Korea would win the ball, re-establish their control, and the whole process started again. Therefore, given how much they were dominating possession (84% in the first fifteen minutes), a Korean goal felt inevitable. Unsurpisingly, Lee Jeong-hyeop scored a header off a corner, because, as discussed in the analysis of the Iran-Iraq quarter-final, Iraq’s defending from set-pieces has been an ongoing issue. Iran’s best chances, though, inevitably came from set-pieces. The Iraq tactical preview prior to the tournament suggested “they’re very weak in the air – for example, Australia’s last five goals against Iraq were all headers, while they conceded twice from corners in a friendly against Peru,” and in this game, Iran scored two equalisers in extra-time from headers, both from corners. Remarkably, Korea scored twice from set-pieces in this game, making it four goals that Iraq have conceded from set-plays in the past two games. Even when Iraqi defenders were able to make contact with the ball when defending set-pieces, the clearance was always very poor. This played a big role in the second goal, just after half-time, with Kim Young-gwon lashing home a volley from just outside the box. 2-0 down after fifty minutes, Iraq had to drastically change their system. Shnishel admitted post-match the plan was to get to half-time at 0-0, but to the credit of his side, they were able to turn from what had been very cautious, defensive tactics to an attack-minded approach. There was no ingenious change of formation, but Iraq simply committed more players forward, giving more support to the previously isolated Mahmoud, who looked to combine with his fellow attackers via little flicks around the edge of the penalty area. Importantly, too, the two full-backs, so reserved in the first half, began to bomb on. Walid Salim and Dhurgham Ismail got into advanced positions and whipped balls in, with Iraq attempting 34 crosses over the ninety minutes. Korea ended up pinned inside their own box for the last half-hour, simply clearing away balls into the area and relying on Son Heung-min to lead counter-attacks (which he did quite well – this was probably Son’s best performance of the tournament). 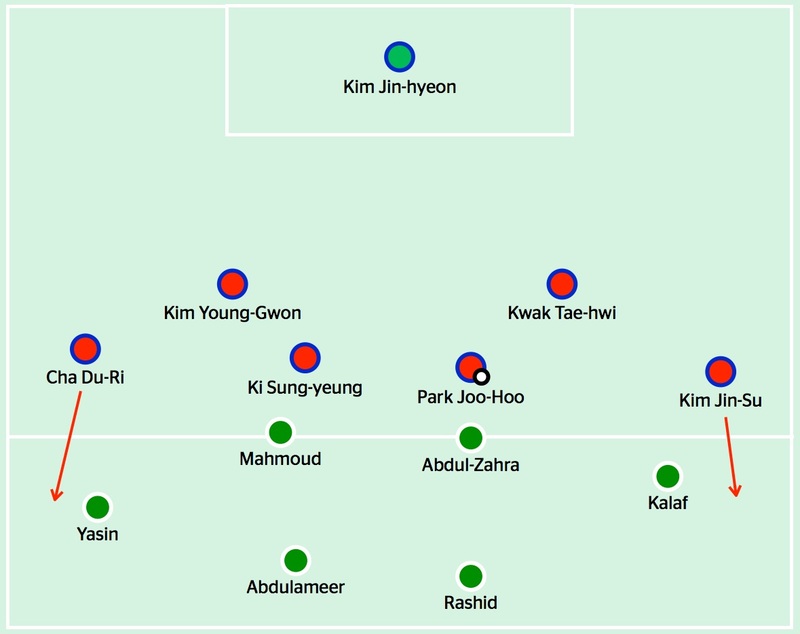 A telling indictment of Iraq’s momentum was that Stielike felt the need to bring on Jang Hyun-soo, a holding midfielder who played alongside Park Joo-ho, meaning that Ki Sung-yeung played further forward as a #10. However, Iraq dominated possession and territory without really creating many genuine goal-scoring chances. It’s telling that they finished with just two shots on target. Across this whole tournament creativity in open play has been a problem, with the midfielders preferring to hit simple sideways passes towards the flanks and the #10 (Abdul Zahra here, before Marwan Hussein replaced him on 77 minutes) staying high up as a second striker rather than looking to find space between the lines. Iraq needed more variety to truly test Korea, and ended up just punting balls in the general direction of the Korean penalty box in the final ten minutes. Still, Stielike’s side never looked completely comfortable, and their incredible run of five consecutive clean-sheets in this tournament (480 minutes, an Asian Cup record) feels like more of an abnormality than being truly indicative of how good Korea are defensively. The gameplan from either side was very obvious in the opening minutes, with Iraq keen to defend in numbers and counter-attack through Kalaf, and Korea happy to play patiently in possession. Iraq’s poor set-piece defending was what lead to Korea’s two goals, but in truth, they never looked completely comfortably defending for long periods even though Korea built up play very slowly. Then, when the boot was on the other foot and Korea had to defend for long periods, they too felt shaky. Iraq’s attacks relied on inefficient crosses and eventually, long punts from the back towards the final third, but Korea still needed some last-ditch blocks and clearances to keep a clean-sheet. Ultimately, they will be delighted with their progression to the final. Judging from the constant criticism of his side in the media, Stielike knows this is a functional side that has grinded rather than glided their way through the tournament. If they win, it will be a victory for efficiency, not entertainment.